Dolan Bullock cufflinks are made using silver and will be the perfect accessory for you. These silver cufflinks are available at Souq.com. Experiment with your look with this pair of Dolan Bullock Gentlemen's Silver Cufflinks. They are vibrant, bright and will add a hint of color to your monochromatic suit. Sporting a round button on each cufflink, this pair looks extremely classy. The vivid striped pattern makes them all the more attractive. The cufflinks come in a chic storage box where you can safely keep your accessory away. 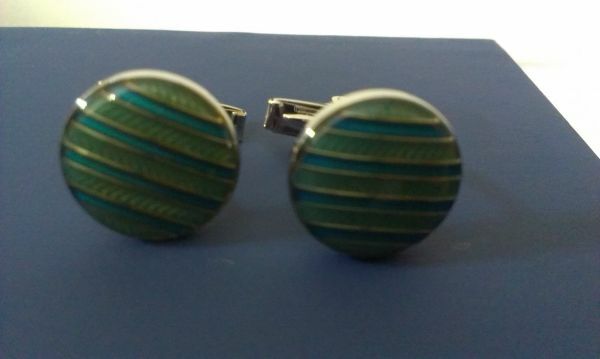 These cufflinks for men feature an interesting stripe pattern in light and dark green. They are designed in a pin button shape, which is one of the most preferred designs of all times. Be it a subtle or a dark colored shirt, this pair of cufflinks will accessorize your look well. The Dolan Bullock cufflinks is made using 925 sterling silver, and thus it has a soft sheen. These silver cufflinks will also be a great gift for your loved ones. The closure further ensures a secure grip on the cuff of the shirt but also can be easily detached when needed.